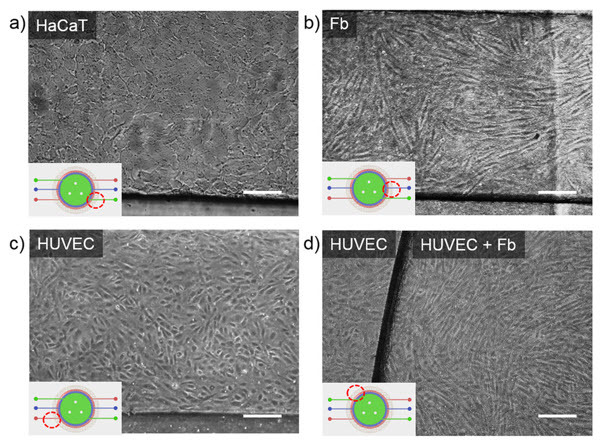 Optical images of cells in a skin-on-a-chip device. The “Skin Avatar,” a roughly two centimetre-sized chip modeling the human skin, is the latest in “Organ-on-a-chip” technology, undertaken by SNU Hospital Professor Tae Hyun Choi and Professor Sanghoon Lee of Korea University. The research began in August 2014. Creating the skin avatar is a long and involved process, requiring the coculturing of the three cell types of the skin, the epidermis, dermis, and blood vessels. To coculture enough cells for a chip requires a full year. The research team received a major setback with the passing of Professor Lee on July 20, 2016, who died of a heart attack while he was attending a conference in Hong Kong. Geon Hui Lee, doctoral student of Professor Lee in the Department of Biomedical Engineering, continued the experiments and eventually produced the results.